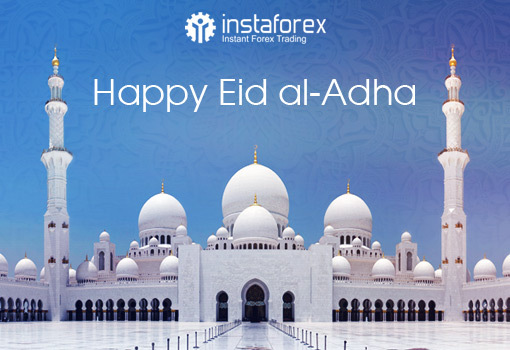 InstaForex congratulates on the holy occasion of Eid ul-Adha! It is always a great pleasure for InstaForex to send warm greetings to its clients and all people who share joy and festivity of these glorious days. We would be happy if our sincere greetings inspire and encourage you and your nearest and dearest. May your life be accompanied by hope and faith. May your heart be filled with serenity. We wish peace, happiness, and Allah’s grace to your families and homes. May your faith help you take wise decisions. May success follow all your endeavors. For its part, InstaForex is exerting every effort to make your goals achieved. May all your projects have successful implementation! We hope Allah guides you to new horizons of prosperity. Only a patient one will conquer a summit. We wish you a smooth, joyful, and rewarding journey throughout your life. InstaForex is always on your side.